This is incredibly awesome. Few days ago, I was taking a deep look at the Dell Inspiron Duo review from Engadget, and now, I’m seeing a knockoff here. It’s smaller in size and less powerful. So what’s the big deal? Check it out after the jump. Dell Inspiron Duo has one big feature which amazed me at first sight, its vertically rotating screen. 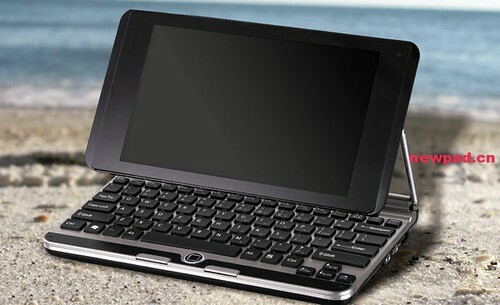 It may look like a netbook until its 10.1-inch capacitive touchscreen did a magical backflip and folded down over its keyboard to morph into a tablet. Yeah, it was like nothing we’d ever seen before. So the knockoff makers copy it and make one for us. What’s its specs? Well, it’s powered by Intel Atom N450 processor with GMA 3150 graphics, includes 1GB of RAM, 120GB hard drive, swiveling 8.9-inch capacitive touchscreen (1024 X 600), two USB ports, SD card slot, LAN port, VGA output, Bluetooth, Wi-Fi, and a 2 megapixels webcam. Oh, it measures at 261×147×25.5 mm and it is magnesium bodied. Looks cool. There are no words on its price and availability, but we’re guessing this Dell Inspiron Duo knockoff will cost no more than 2000 yuan (about $300). One more thing, it is available in 4 colors.